At some point, it became a thing for the host of an award show wear a different ensemble every time she hits the stage. Last night, Eva Longoria hosted the "prestigious" MTV Europe Music Awards, and fulfilled her presto-change-o requirements. As you can tell by this short satin number —truly putting the "little" in little black dress — Eva's thighs were her cohost for the evening. Another tiny dress, more thighs. Is this Natalie Portman's costume from Black Swan? This intergalactic purple thing marks a demure moment for the Desperate Housewives star. Since Eva covered up, she had some friends do the skin-baring for her. Red hot, tiny and tight — perfect for playing sports. Referencing Lady Gaga's meat dress, Eva hammed it up. 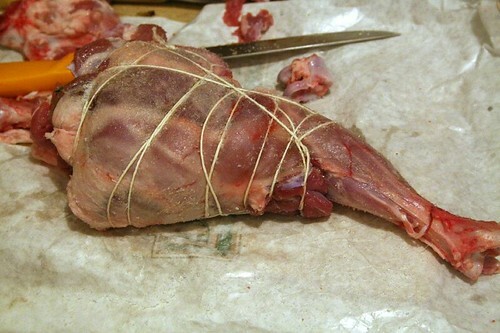 Perhaps the side view — in which you see Eva trussed like a leg of lamb — will do the trick. What's that you say? This poop-colored dress is not that bad? And she's not showing any thigh? Don't be fooled. The fog hides a multitude of sins. Thighs! And a train. The crap-hued mullet dress will haunt my dreams. And when Eva did try to cover those thighs, Katy Perry took it upon herself to stage an intervention. "Thank you for being with us and celebrating the international language! No, not music. Legs! Specifically thighs. Goodnight!"